Does your family have a go-to salad recipe that you enjoy as part of dinner multiple times a week? This is ours, originally created by my dad and made with just five ingredients, including several Avocados From Mexico, tomatoes, a cuke, red onion and hot sauce. It’s SO easy-to-make, SO delicious and super healthy — try it this March, aka nutrition month! 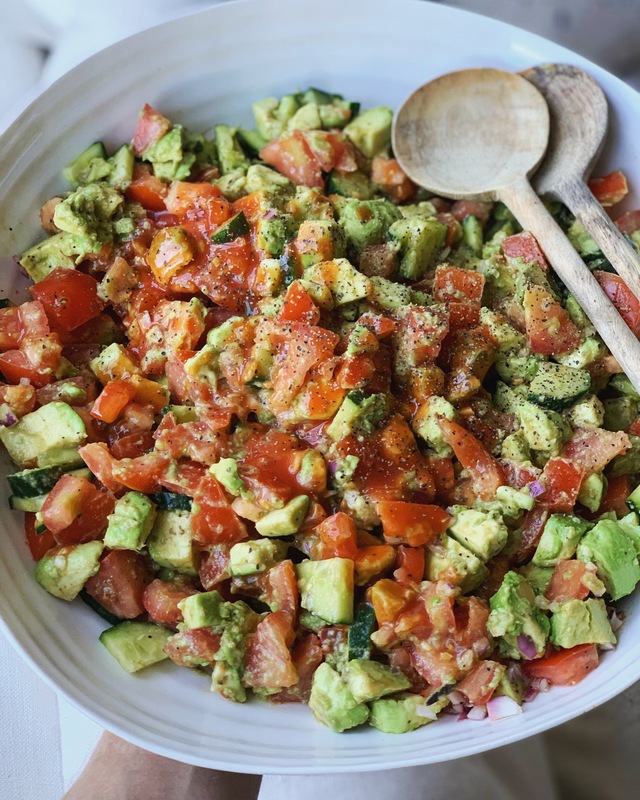 I love loading up my plate with a big portion of this salad, which ends up reminding me a bit of guacamole because I toss it so much that the creamy avocado mixes together with the hot sauce and turns into a bit of a dressing…it’s a perfect way to get those healthy fats and avoid the less healthy fats, like some oils. This recipe is oil-free, cholesterol-free, gluten-free and plant-based…and, even my grandma loves it, which is saying a lot (she is the biggest, most honest critic). She requests it for every dinner we share together. Avocados are nutrient boosters — they help the body absorb more fat-soluble nutrients from the other foods you’ve eaten. In just 1 oz of avocado, you’ll find 20 nutrients, such as vitamins, minerals and phytonutrients. Their creamy consistency makes them one of the first fresh foods a baby can enjoy, and they go great with other mashed fruits and veggies (Roen sometimes eats up to two avocados a day!). Tag us (@erinireland @avosmexico_canada) if you try this salad — we would love to see! 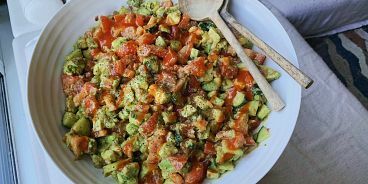 Add all ingredients to a large bowl and toss for a good three minutes (until avocado gets a bit mushy and begins mixing with the hot sauce to create a dressing). Enjoy fresh or as leftovers. Read about the Avolifestyle and access hundreds of avocado-centric recipes by visiting avocadosfrommexico.ca. Thank you Avocados From Mexico for sponsoring this post!